The pure pop of XTC returns with their latest release, Apple Venus Vol II Wasp Star. Interviewing XTC, for me, was not easy. I've been a fan for way too long and I've always seen their music as "power pop" at its best. Their lyrics are witty and insightful and their melodies irresistibly infectious. 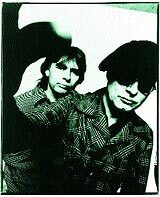 The band has been through changes but Andy Partridge and Colin Moulding have been the nucleus of XTC since 1976. XTC has 12 albums to their credit that include such gems as "Making Plans for Nigel" (most recently covered by Robbie Williams), "Life Begins at the Hop," "Senses Working Overtime," "Generals and Majors," "Love On a Farmboy's Wages," "Mayor of Simpleton," and the one that got the most attention at radio, "Dear God." Since then (1986), the band has been less prolific, but there were reasons. Last year's Apple Venus Vol I had been their first release since '92's Oranges & Lemons, but it was in that interim that XTC fought a protracted dispute with their previous label, lost guitar player David Gregory, and Partridge went through an acrimonious divorce. XTC is now down to the core duo of Partridge and Moulding and is releasing Apple Venus Vol II Wasp Star May 23. The album sounds much more like Partridge and Moulding's early work, and much less lush than the textural Vol I (which it should be mentioned has been chosen by the Neta Pulvamacher Dance Company because of its rich arrangements, for a ballet presentation of the entire work, in June at the Kitchen in New York). Meanwhile, Vol II is much less orchestral, with songs written for and performed with the building blocks of rock: guitar, bass, and drums. Despite the contrast, both Vol I and Vol II share a lyrical and emotional unity. Both were written in the same dark period of loss in the late-'90s. Dave Einstein: Lyrically Apple Venus Volume I and the latest, Volume ll Wasp Star, feel like a whole project rather than two separate albums. Andy Partridge: That's true they are. After Vol I, I was wondering if you had decided to leave the song-based format to work on a grander scale. AP: No, we still work on songs. No matter what you cloak it in or what clothes it's wearing it's still a song. That's our favorite form. Who were your songwriting influences? We feel that there is a certain fascination in this country for the exotic. In some way, this wacky, little snail encrusted island (England), with all of its doings, is really appealing to some Americans." AP: Lennon & McCartney, Hal David & Burt Bacharach, Ray Davies, Irving Berlin, and Lerhner & Lowe. The technique was blended with the rock & roll that we grew up with such as the Stones, the Kinks, and the Beatles that were all rooted in British Music Hall form. The Beatles were at times harkened back to the Edwardian period. Colin Moulding: In some of the early Ray Davies songs you almost hear Noel Coward in them. Do you feel that the "Britishness" of your music has keep you from huge success in the U.S.? AP: Perhaps. But at the same time, we feel that there is a certain fascination in this country for the exotic. In some way, this wacky, little snail encrusted island (England), with all of its doings, is really appealing to some Americans. It's a weird culture that is thousands of years old, and some people in this country find it very interesting. CM: We've always felt that if we make it big over here, it will be by accident. Our biggest success to date was "Dear God," and it was a b-side of "Grass" that happened to get airplay over here when Skylarking was out and we wound up putting it back on the album after it had originally been taken off. Our label was only days from letting us go at that point. AP: I don't remember that part, but I do remember that "Dear God" polarized the listeners. Especially in Middle America, which is very fundamentalist and its all about big guns and power and a lot of people felt threatened by that song. It was sort of a kick below the Bible belt, if you will." Some of your other songs also held up social issues to scrutiny as well, like "Melt the Guns." AP: "Melt the Guns" got us threatening letters as well. Going back to the current project, will there be a ‘demo’ version of the new album as there was for Vol l?" AP: We are really not sure. On one hand there is a lot of charm in the demos. It's like seeing sketches of an oil painting before it goes to oil and canvas. But we are really not sure whether it might be too much. Well the finished album of Wasp Star is produced in a beautiful way. Did you do anything different this time? AP: We really edited this album much more than previous albums because of the available technology. There is no more rewinding of 24-track tape and splicing. Computers have made it much easier to edit quickly and get it right where you want it. AP: "Stupidly Happy." Just the idiocy of it. Just working one chord and making it happen.